I found this picture online. 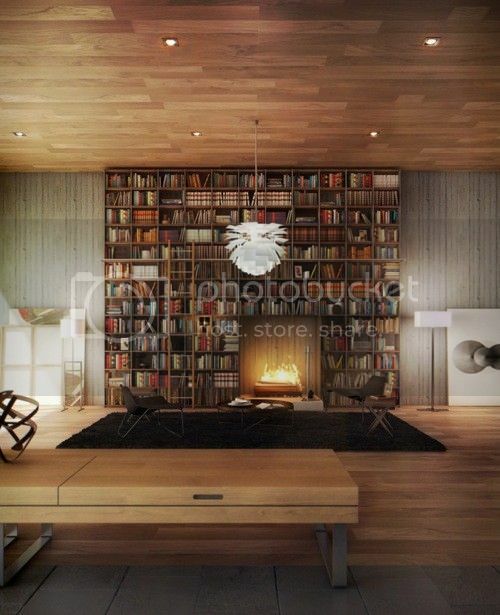 Gorgeous bookshelves and such a striking room. The open flames so close to all those books leaves me feeling a bit nervous though! I'm pretty sure the fire must be artificial... it doesn't appear that there's a chimney attached. Do you like the books? All those matching spines make me think there must be a lot of encyclopedia sets in there, but on the whole I love the look of a "wall of books." @Jenny Wow, I didn't even notice the matching floor and ceiling. Good eye! @Smalls I had the same thought (about not being able to reach the top shelves) but if you look carefully, there's a rolling ladder on the left hand side of the bookshelves. Definitely necessary if you want to reach those high up shelves... those chairs look tiny in comparison to the rest of the room. It's definitely a space that I'd feel dwarfed by. That looks simply amazing, thank you very much for sharing this.